Colin Murray and friends will brave the elements all for a good cause. Are you brave enough to walk around Belfast in a mankini with broadcaster Colin Murray? The talkSPORT presenter is going to walk around Belfast city centre on Boxing Day in a green mankini - and he is looking for volunteers to join him. 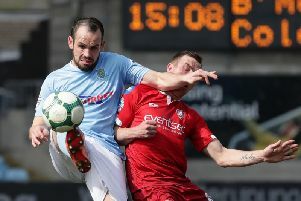 In February Murray tweeted that he would run around the city in a revealing one-piece if Northern Ireland qualified for the European Championship finals. And now, presumably having spent some time kicking himself, he has vowed to make good on his promise. On Boxing Day, at 8.30am, he’ll make a circuit of Belfast City Centre decked out in the hideous outfit and he’s looking 100 fellow Ulstermen and women to ‘stand up’ beside him. “I had two options. To do it at 4am on my own like a coward or pull on that mankini loud and proud,” said Murray. The route Colin and company will take around Belfast. “I’ve been involved with Football for All for ages and this is a chance to raise some serious cash! Murray called for volunteers to come out and join him, for what is sure to be a brisk walk. “I already have a famous musical son from Northern Ireland signed up but I’m coming for them all,” he said. Come on!!! Almost everyone is off work, it’s the season of good will and it’s a chance to have a proper laugh along the way! All money raised will go to Frame Football in Northern Ireland, which will bring children with physical disabilities together to play an adapted game that suits their needs. Murray added: “Come on!!! Almost everyone is off work, it’s the season of good will and it’s a chance to have a proper laugh along the way! He added: “It’ll be a right laugh. Registering is easy and we will have one central fundraising page.